Jon Hicks and making icons. Jon Hicks, talented designer, and renowned for the making of the Firefox and Pathfinder icons amongst others, has shared slides of his presentation on icon design. I found it an interesting look into the mind of a great designer. Due to problems with setting up the payment processing system, IconResource has been delayed by a week. I found this most disheartening and extremely annoying, but there’s very little I can do about this; it’s all in the hands of my payment institutions at this moment, so all I can do is wait patiently. Again, my apologies; I look forward to seeing you all when we do launch, in a week on April 2nd. Edit; if you want to give some valued input, fill this one-question Google survey about the pricing of the pack. Your input is highly valued! I never eagerly post products from my competitors or even friends, but my designer friend Josh Pyles has released UI Candy today, a beautiful resolution-independent set of glyphs for your apps, and I found the design too good to leave unmentioned. The webdesign is remarkable and eye-catching, but that shouldn’t distract from the strong set of pictograms in the pack. I invite you to hop over to Josh’s UI Candy site and take a gander. Although a bit earlier than I wanted to announce this, an inside scoop on the latest Mac Developer Roundtable forced me to put up at least something. IconResource is my biggest new project. What’s IconResource? It’s a video series aimed at intermediate computer users (no Photoshop knowledge required), and aims to teach you about the theory and techniques of icon design. Basically, it teaches you A-Z how to make icons, directly from the source. To get a good insight into its ‘features’, visit the preliminary website. A select amount of individuals have already been invited to ‘sample’ the videos before release, and I will adhere to my March 26th release to the public. Pricing will also be announced at that time. For now, don’t hesitate to leave your feedback on this great new endeavour Cocoia is embarking upon! 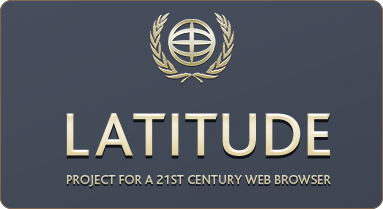 Latitude, my dream browser project, has now got a website. Since we now have a real team together, you can keep your eyes on this webspace for updates on this project. Of course, we are in an early stage, so please don’t ask for a tester spot yet, but we’ll update this as it goes along, with the design document and all coming up. Bobby Andersen’s short talk on icon design and 3d icon design (at C4) is now up on viddler, and I challenge you to watch it. Unlike Wil’s talk, it’ll consume about 20 minutes of your day – plus, you get to listen to one of the best icon designers around.